Furnace and Air Conditioner Toronto. Furnace, Water Heater and Air Conditioner Toronto. How many times did you want to change the heating system or cooling system at your place only to be disappointed thanks to the enormous cost involved? Does that mean that one needs to stay in an extreme cold or hot environment? Absolutely not, you can opt for rent to own AC or furnaces as desired. These rent to own heating and cooling options ensure that you get to heat or cool your home at an affordable rate. The whole concept of renting a furnace or air conditioner for heating or cooling is almost similar to renting a car. Just like in case you do not have enough money to rent a car, you end up leasing one. Similarly, you can pay a monthly charge and enjoy all the benefits of a furnace or air condition. One visit to http://www.acfurnacegta.ca/ will take care of all your heating and cooling options. Since the year 1995 , they are offering the best and most valued options to provide cooling and heating options for home. The best part being that these options are rent to own ones that do not pinch the pocket. Their efficient customer service officers work round the clock to ensure that all your heating and cooling relating options are dealt with in a jiffy. The cost involved in doing up the entire heating or cooling system of your home can cost a bomb. Though having adequate heating or cooling system in place is an absolute must, it is not always a feasible option. Your months of savings can go into the repair cost. Hence, the best and most affordable option for heating up or cooling down your home is to opt for rent to own furnaces or air conditioners. The cost involved is almost negligible when compared to the cost of installing a new one. The monthly charges start from paltry amount of $2695 per month. While the cost of installing a new heating system or cooling system can run into thousands of dollars. 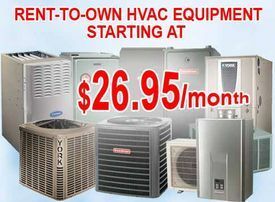 That’s not all, all the rent to own air conditioners and furnace options come with warranty. The parts used to make these furnaces are of reputed companies that have a warranty period of as long as 10 years. Moreover, these rent to own air conditioners and furnace come with a 10 year labor warranty. Unlike other shops, this online shops not only provides the rent to own furnace or air conditioning options but also have experts who are equipped in repairing old and damaged furnaces and air conditioning systems. As a result after sale services of this online portal is quite impressive. The best part is that they have an exciting Annual Maintenance Package that will take care of all your worries in regards to your old furnace and air conditioners. No matter, what kind of rent to own cooling or heating option you might be looking for, you will find all the solutions in this portal.